Why OBP is not participating in KU Open Funding: and why libraries should understand the reasons. Firstly, it is worth noting that this service is designed to address issues of importance for sustainable OA book publishing. If business models for Open Access book publishing involve any form of funding transfer from an institution (university/grant body etc.) 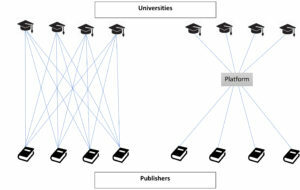 to the publisher (and there are many different forms this may take), then there are potentially significant transaction costs for each institution (and publisher) in setting up and administering these payments (if there are U universities and P publishers – then there are U x P financial flows to set up and maintain). These costs can be significantly reduced if all the transactions flow through a central hub – or platform – allowing each university or press to maintain just a single connection with the platform, rather than lots of individual connections. This reduces the number of connections for each university or press to just one, and across the whole system the number of required connections falls from U x P to U + P. In a world with lots of universities and lots of publishers, the potential savings are significant. Many such collective payment services already exist within the library community – although none focused entirely on OA books (e.g. JISC Collections in the UK provides a similar, but non-exclusive service for UK libraries wishing to pay subscription and other fees to publishers – including library membership fees to OBP). Secondly, many scholars and libraries are finding it difficult to keep up with the increasing diversity of OA publishing services and charges being made available by different publishers. Therefore, having a well-referenced, easily navigable and user-friendly source for this information would be valuable. So – why is OBP not going to participate in this KU offering? To begin with, we have had growing misgivings about the objectives and actions of KU since it transitioned from being a “non-profit” community interest company (registered in the UK) to a “for profit” commercial entity (registered in Germany), and in their own lack of openness about their business model and operations, echoing the concerns articulated by Marcel Knöchelmann his LSE Impact blog post. “PUBLISHER hereby grants to KU the exclusive right to sell and market its Product in all territories worldwide (the Territory), exempt from this exclusivity are business activities where customers prefer a direct relationship in sales and marketing support with PUBLISHER. Libraries wishing to interact with any of the publishers involved in the platform are forced to either become part of the platform themselves, or to develop a 1-to-1 relationship with each publisher. KUOF is effectively able to establish exclusive control over a library’s access to the OA publishers, and so is able to sustain higher price margins to enable access. It also stands in stark contrast to the values of many involved in OA publishing. There is an extensive economics literature about both of these types of restrictions, but we will summarise the most relevant issues. The exclusivity restriction on the publisher significantly reduces the possibilities for alternative services to emerge and competitively enter the market. Publishers are forced into an all-or-nothing decision about which platform to engage with, so any alternative platform that may emerge needs to be able to replace the existing one in its entirety, rather than just provide additional services. This makes it far more difficult for an alternative platform to attract publishers and establish itself, thus significantly reducing competitive pressure on the incumbent platform and increasing the possibility of a single platform dominating the ‘market’. The exclusivity condition on publishers also has significant implications for libraries and research funders. It is widely recognised in the economics literature that a platform which is able to ‘capture’ one side of the market (e.g. publishers) will be able to extract profit from the other side (e.g. libraries/funders). As any library wishing to have access to the publisher is forced to do so though a specific platform, that platform is able to place a ‘toll’ over access – and so sustain higher profits from libraries. (This is similar to the traditional publishing model actually – where a journal has exclusive rights to an article, and it is this exclusivity that allows them to charge libraries increasingly higher fees for access to those articles). Thus the exclusivity condition on publishers sets up a system which allows increased revenue to be extracted from the libraries. Of course, this is precisely the type of structure OA has been trying to overcome. So, in this case, if KUOF successfully attracts large, or a significant proportion of, publishers to agree to these terms, then libraries and research bodies will either have to use KUOF to engage with those publishers, or be forced to establish many expensive 1-to-1 relationships and make individual payments to the publishers involved. Thus KUOF will have the ability to sustain significant margins over the income flow from libraries to publishers, if they so wish. If KUOF decides to charge, for example, 10/15/20% commission for arranging the transfer, then KUOF will receive 10/15/20% of all HE funding for OA books directed to participating publishers. And if that is a large proportion of publishers, it could amount to nearly 10/15/20% of the entire HE sector funding for OA book publishing. Furthermore (as explained above), the exclusivity condition on the publisher side reduces the ability of any other platform to enter the market and put competitive pressure on that markup and revenue flow. From a commercial viewpoint this is an attractive business model – and there have been several recent “business school”-type books explaining it some detail. From a social (or even a library) perspective, however, this type of platform is likely to be damaging in the medium/long run as it reduces competition and allows higher revenue and profits to be sustained by the platform. In addition, the handy ‘tool’ developed to allow authors to find appropriate OA publishers – which could be genuinely useful – becomes, when tied directly to a platform, a very effective way of tying both the libraries and the publishers to the platform, thus reducing further the possibility for effective competition. On the one hand, the authors’ institutions are incentivised to join the platform to gain access to the tool for their scholars (and it would be interesting to know if there is a similar exclusivity clause in that contract for libraries as well). On the other hand, it forces publishers to participate in the platform, not in order to gain efficiency from the financial transfers, but simply to be discovered and chosen by authors. This is the type of ‘killer app’ that many digital platforms strive for – tying down both sides of the market at the same time. Again, there is a fairly extensive economics literature on the anti-competitive impact of ‘bundling’ an app with a platform, and the ability to use this to stifle competition. The “anti-trust” case brought against Microsoft for integrating their Windows operating system (platform) with Internet Explorer (app) is probably the best known example of this. Finally, it concerns us that while the KUOF platform is initially focused on book publishing (KU has an established commercial product for library consortia funding of OA books), it appears to also have broader objectives to expand into article/journal funding as well. Again, this is a well-documented business practice for successful platform development: start in one sector/region and then scale through expansion into associated sectors (think of Uber expanding city by city, or Facebook moving from campus to campus). Such a process would increase further their market power and influence in the broader OA publishing ecosystem – naturally extending our causes for concern further. As a result of the issues highlighted here, instead of signing on to KUOF, we would much rather partner with organisations wishing to develop an alternative platform for publisher-library relationships that would be non-exclusive, open, community-managed and non-profit. And to partner with developers of alternative OA publisher discovery and information systems designed around the needs of authors and librarians which are not tied to a particular funding platform. These desires form some of our motivations for joining with other OA publishers in the creation of ScholarLed, a coalition of non-profit, academic-led OA book publishers seeking to pool expertise and create open infrastructures for OA book publishing – and the broader RadicalOA collective, which is devoted to OA publishing as a communitarian, non-profit, researcher-led endeavour in the service of the broad and open dissemination of publicly-funded research. Libraries and other publishers will, of course, make their own decisions, but we hope they will at least do so with an understanding of the potentially negative, longer-term implications. We also hope that funders will recognise the importance of developing open and collectively-controlled, community-driven infrastructures to sit alongside, and so place a competitive check on, profit-oriented alternatives. However, all of this requires action sooner rather than later; otherwise, there will be an established player and structure that is extremely difficult to displace. This entry was posted in How Open Access Works, Libraries and Open Access, Notes From The Editor and tagged Academic Publishing, Open Access, Open Book Publishers. Bookmark the permalink.